Western starring Dale Robertson and Linda Darnell. 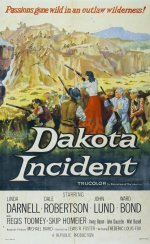 After their stagecoach comes to grief in hostile desert terrain, a group of passengers find themselves facing attack by a band of marauding Cheyenne Indians. This is a curiosity for several reasons. It will be obvious from the start that it was made long before anyone ever thought of political correctness. Although, the Ward Bond character softens the edge with "maybe we can communicate with them, after all they're humans, too" type of dialogue. His part stands side-by-side with the preacher attempting to communicate with the Martians in War of the Worlds. In fact, it's uncanny. The title is curious too. Use of the word "Incident" contributes an importance and sophistication to the film that probably didn't hurt boxoffice. The contrived assortment of characters and Linda Darnell's fancy dress and hat are wonderful dated touches that make Dakota Incident a cool western artifact from the mid-fifties.